Ongoing mucus or phlegm problems can make your life hell. According to the American Academy of Otolaryngology-Head and Neck Surgery, about 12.5 percent of Americans suffer from at least one bout of sinusitis each year (1). Sinuses are air-filled cavities located on either side of the nose. Due to certain allergies, cold, viral or bacterial infections, the sinuses may become clogged or infected. The Infectious Diseases Society of America states that 90 to 98 percent of sinusitis cases are caused by viruses (2). When the sinus cavities become inflamed or irritated, they swell and secrete more mucus, making proper drainage difficult. Also, smoke, environmental pollution as well as dietary irritants like dairy, gluten and artificial additives all can trigger changes in mucus that can make you feel uncomfortable and frustrated at the same time. Clogged sinuses can lead to various symptoms and related issues, such as headaches, snoring or difficulty breathing. In serious cases, a sinus infection may even lead to brain fever or meningitis. For sinus drainage, there is no need to see your doctor. In fact, you can use some simple and effective home remedies to open up your sinuses and relieve the discomfort. 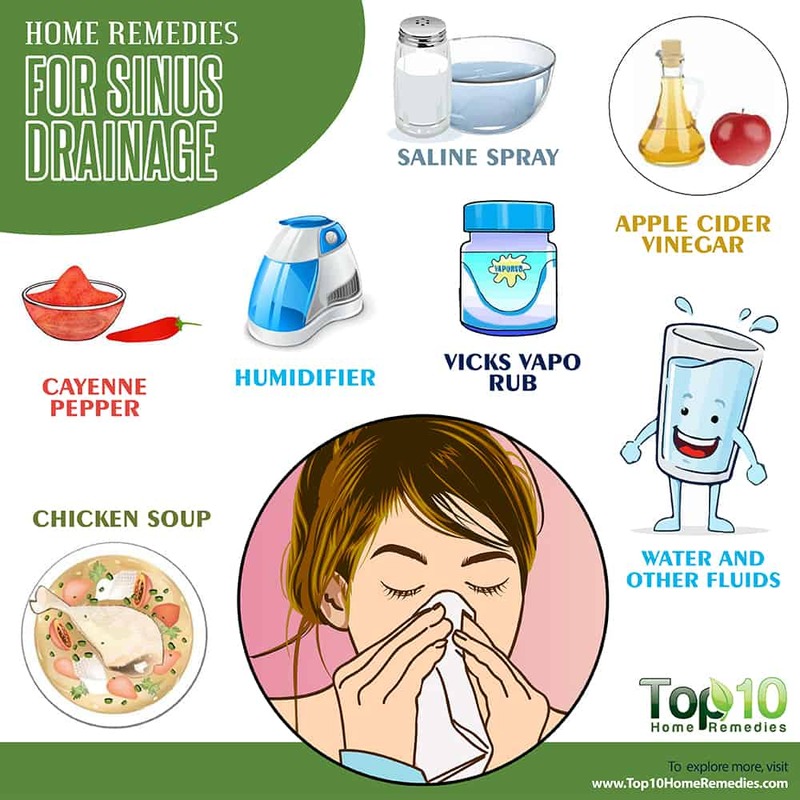 Here are the top 10 home remedies to promote sinus drainage. Whether you use plain water or infuse it with herbs or essential oils, steam inhalation is effective at promoting sinus drainage. It works as a natural expectorant to clear the blockage. It also soothes the inflamed blood vessels in the sinuses by keeping them moist. Fill a pan with water, heat it until it boils and then turn the heat off. Add a few drops of peppermint or eucalyptus essential oil to the hot water. Put a towel over your head, lean over the pan and inhale the steam for a few minutes. Do this 2 to 4 times a day. Alternatively, close the bathroom door, run a hot shower and breathe in the steam vapors for 5 to 10 minutes. Do this daily for a few days until the symptoms clear. Caution: Steam inhalation is not recommended for small children, pregnant women and those suffering from high blood pressure, a heart condition or a central nervous system disorder. Nasal irrigation is very effective for aiding sinus drainage and relieving nasal congestion and irritation. 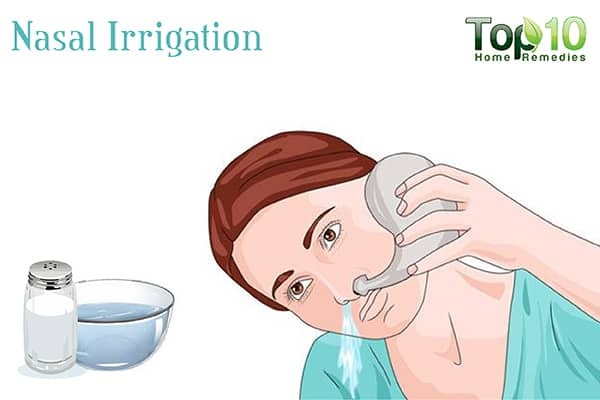 Also known as saline irrigation, this involves gently flushing out your nasal passages with a saline solution. This helps break up the congestion by thinning out the mucus. It also increases the moisture in your nostrils, which in turn helps reduce the inflammation of your blood vessels. A 2008 study published in WMJ, the journal of the Wisconsin Medical Society, reports that hypertonic saline nasal irrigation is beneficial for relieving daily sinus symptoms (3). Mix 1 teaspoon of this mixture into 1 cup of lukewarm boiled water. Lean your head over a basin and gently squirt the solution into one nostril, while keeping the other one closed with your finger. Allow the solution to drain from the other nostril by removing your finger. 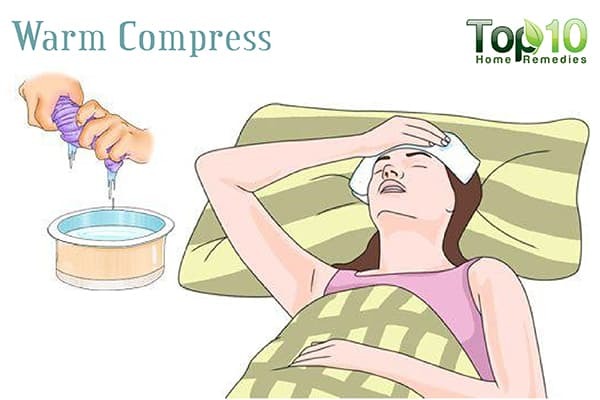 Another effective way to keep mucus thin to promote sinus drainage is applying a warm compress. Do it for 3 to 5 minutes. Repeat as often as necessary until all the mucus has cleared. 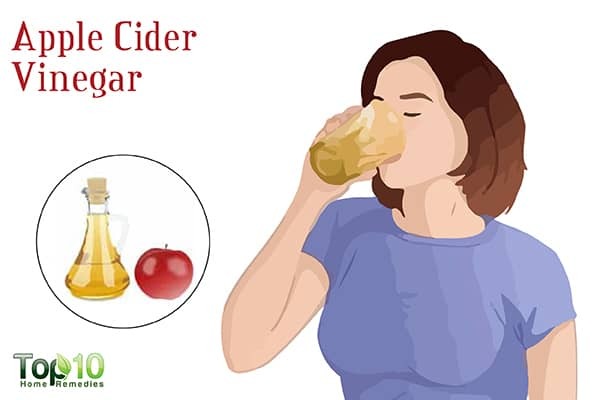 Another good remedy for blocked sinuses is apple cider vinegar. Its high potassium content helps thin the mucus. Also, the acetic acid in it prevents bacterial growth and speeds up the healing process. Mix 2 tablespoons of raw, unfiltered apple cider vinegar and 1 tablespoon of raw honey into a cup of warm water. Drink this tonic twice daily. Also, pour ½ cup each of raw, unfiltered apple cider vinegar and water into a pan. Bring the mixture to a boil and remove the pan from the heat. Put a towel over your head and inhale the steam for 3 to 5 minutes with your mouth and eyes closed. Repeat a few times a day. Another tried-and-true remedy for sinus blockage is chicken soup. The steam combined with the antioxidant and anti-inflammatory effects of the soup’s ingredients help clear the sinuses. Several studies have concluded that chicken soup inhibits the production of inflammatory compounds that are released in response to a viral infection. One 2015 study found chicken soup helps clear nasal congestion better than hot water (4). Chicken soup also improves the immune system functioning. 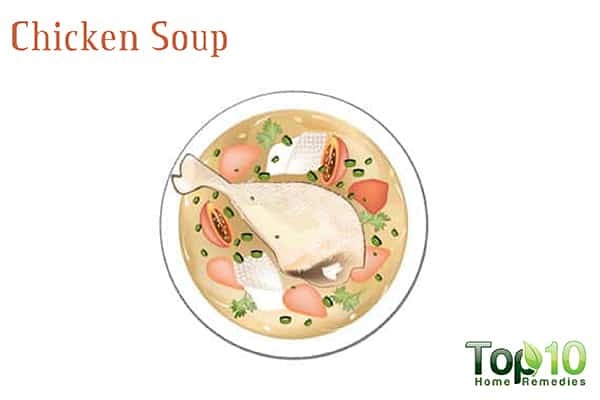 Plus, chicken soup is a light and nutritious food that you can always have when you are sick. To ease your symptoms, have a bowl of homemade chicken soup twice daily. To reap the maximum benefits, make it at home using organic chicken and vegetables, such as carrots, beetroots and spinach. To boost its effects, add chopped garlic or red pepper flakes to the soup while preparing it. If making homemade chicken soup is not possible, you can have canned soup also. Cayenne pepper is a natural decongestant, meaning it helps loosen mucus and promote sinus drainage. 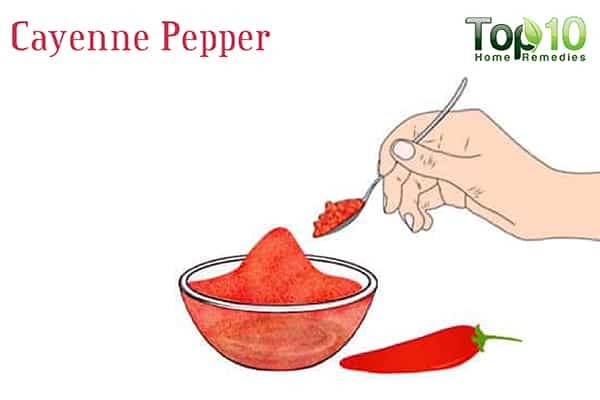 Add ¼ teaspoon of cayenne pepper powder to a cup of boiling water. Sip a cup of this tea a few times a day. 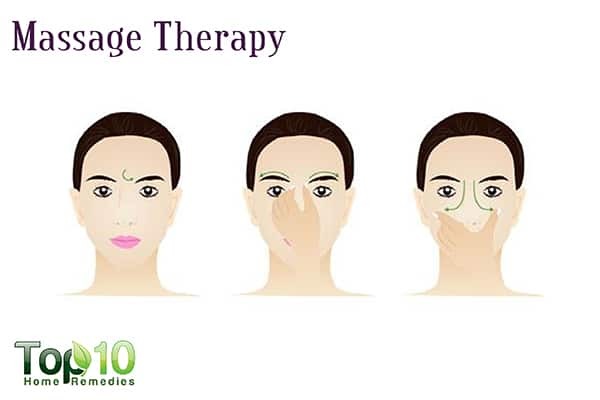 To aid sinus drainage and improve breathing, massaging the nostrils is a simple yet highly effective remedy. Massage improves circulation to the area, and this helps thin out the mucus. Using your left thumb and index finger, massage both sides of your nose and the bridge of the nose for 1 minute. Take a break of 1 minute and do it again. When performing this massage, breathe through your mouth, not your nose. For sinus drainage, nothing works better than increasing your fluid intake. Drinking more fluids helps thin the mucus and drain your sinuses. They also lubricate your sinuses and keep the lining hydrated. 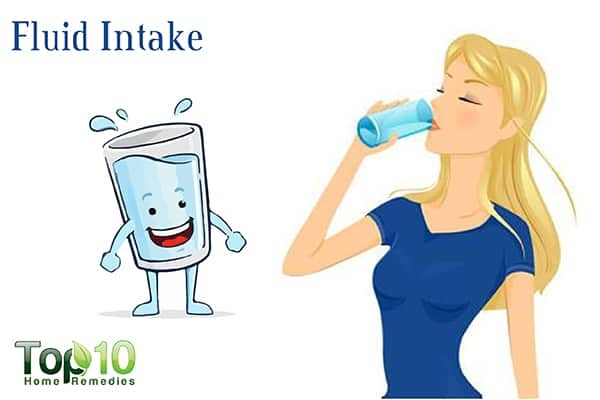 On the other hand, reduced fluid intake can cause dehydration and ultimately lead to thickening of the mucus. It can even increase the risk of infection. Drinking hot liquids, such as herbal teas, may also help loosen and thin out the mucus. To know whether your body is hydrated, check the color of your urine. If your urine is clear, you are sufficiently hydrated. Increasing the humidity in your home or the room in which you sleep can aid in sinus drainage. The sinuses prefer a moist, warm environment. Moist air can soothe irritated tissues and swollen blood vessels in your nose and sinuses. On the other hand, lack of moisture in the air can irritate the sinus cavity further, causing more congestion. 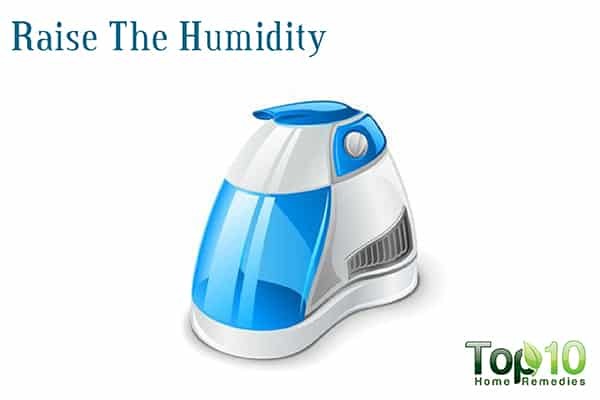 So, try to run a humidifier and maintain a humidity level of 45 to 50 percent. Make sure to put a humidifier in your room where you sleep. But bear in mind that keeping the machine clean is of the utmost importance, or else the growth of bacteria and mold will only serve to exacerbate your condition and contribute to further mucus formation. Vicks VapoRub, a popular over-the-counter decongestant, can also aid in sinus drainage. It has active ingredients like camphor, eucalyptus oil and menthol that help clear the congestion and make breathing easy and comfortable. Before going to bed, rub this topical cream gently on your chest, back and throat as well as your nose to make breathing easier and help you sleep properly. Also, boil some water in a pot. 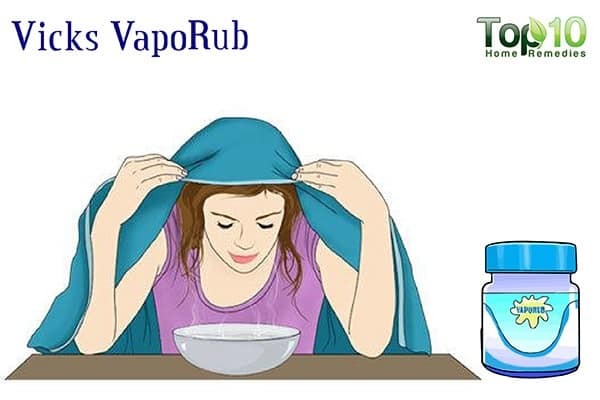 Turn off the heat and put a small amount of Vicks VapoRub in it. 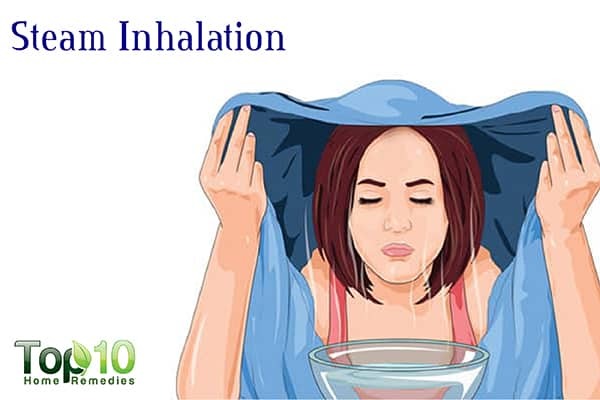 Stand over the pot with a towel over your head and try to inhale the steam for 1 to 2 minutes. Repeat as needed. Caution: Do not use Vick VapoRub on children under age 2. Also, do not use steam inhalation for children under age 12. The most obvious way to clear mucus from the nasal passages is to blow your nose on a regular basis. Sleeping with your head elevated is a great way to relieve congested nasal passages and enjoy a good night’s sleep. Boost your immunity by including more foods rich in vitamin C in your diet. Animal dander, dust, mold spores and pollen are the most common airborne irritants that cause sinus inflammation and congestion, so keep your house clean as much as possible. Pollen, smog and car exhaust are some common outdoor irritants that can worsen your symptoms. Hence, consider wearing a mask when going out to keep them out of your airways. If you are sensitive to gluten, dairy and sugar, try eliminating these foods. Drink ginger tea 2 or 3 times a day. Include raw garlic in your diet as much as possible. Avoid certain foods to reduce mucus, such as dairy products, grains, sugar, and potatoes and other starchy root vegetables. Chronic rhinosinusitis: epidemiology and medical. Journal of Allergy and Clinical Immunology. https://www.ncbi.nlm.nih.gov/pubmed/21890184. Published October 2011. Most Sinus Infections Don’t Require Antibiotics. IDSA : Infectious Diseases Society of America. http://www.idsociety.org/2012_Rhinosinusitis_Guidelines. Nasal irrigation for chronic sinus symptoms in patients with allergic rhinitis, asthma and nasal polyposis: a hypothesis generating study. Wisconsin Medical Society. https://www.ncbi.nlm.nih.gov/pmc/articles/PMC2755042. Published April 2008. Chicken soup clears congestion and helps the immune system fight infection. Daily Mail Online. http://www.dailymail.co.uk/health/article-3371839/Why-chicken-soup-really-help-cure-cold-Comforting-broth-clears-congestion-helps-immune-fight-infection.html. Published December 23, 2015.